Split open Oreos, dividing the cookies into one bowl and the frosting into another. Set aside ten cookies for garnish. Mix together the Oreo frosting and the cream cheese. Halve the mixture and combine one half with raspberry jam. Beat the cream until it forms stiff peaks. Divide between the two bowls of cream cheese and stir to combine. Place the cake ring on a cake plate and begin to assemble the cake. 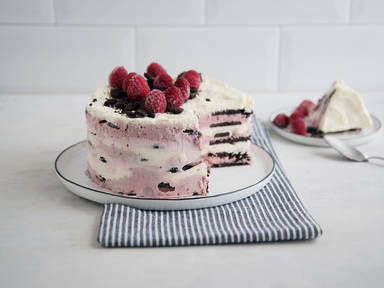 First, add a layer of cookies, then the pink cream, cookies, white cream. Repeat until all is used up. Use a rubber spatula to even out the layers. Place in the freezer to chill for approx. 8 hrs. Remove cake from freezer and remove cake ring. Crumble the remaining Oreos. Sprinkle them over the cake and decorate with frozen raspberries. Enjoy!